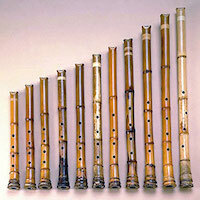 Join Kat Whatley on Monday November 16 Afternoon New Music for part one of a two part series on contemporary shakuhachi (a Japanese end blown bamboo flute) music featuring a panel discussion with three prominent American shakuhachi musicians: Elizabeth Brown, Ralph Samuelson and Ned Rothenberg. The musicians will discuss traditional pieces, 20th century modern compositions for the shakuhachi and contemporary shakuhachi music. ed Rotheberg has been an active member of the New York downtown music scene since the late 70’s and plays alto saxophone, clarinet, bass clarinet, and the shakuhachi. Ralph Samuelson has been playing shakuhachi since 1969, when he was introduced to shakuhachi as a Wesleyan graduate student. After studying with master musicians in Japan, he returned to the US, and has been teaching and performing the shakuhachi worldwide ever since. Elizabeth Brown has been playing and composing for the shakuhachi since 1984, and her music has been played in Japan, the Soviet Union, Colombia, Australia, South Africa and Vietnam as well as across the US and Europe. The aim of this two part series is to reexamine the role of the shakuhachi within the context of 20th century and 21st century New Music. By featuring both traditional and contemporary compositions, as well as discussions about the political and social background of the instrument, we hope make evident that the shakuhachi is more than just a Japanese heritage instrument. No other Japanese instrument has been taken up by so many musicians in so many countries with such varied musical backgrounds.